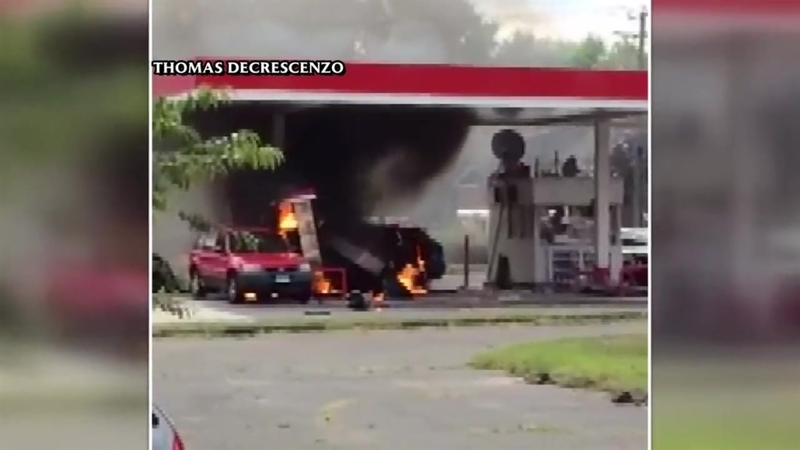 Police roped off a gas station in East Hartford after an SUV barreled into one of the pumps Thursday, causing a fiery explosion. Fire officials said the car drove over a median and struck two other vehicles before smashing into a gas pump at the Phillips 66 station on Main Street in East Hartford. Six gas pumps were destroyed. Footage from the scene shows flames erupting after the crash. A gas pump appears to explode as a police cruiser pulls up to the scene. "We look out the window from the restaurant and it's just flames shooting up... gas shooting up, tires are melting, cars melting," said Thomas DeCrescenzo, who saw the aftermath of the crash. "We didn't know if the whole place was going to go up, and the gas lines." Acting Deputy Fire Chief Jay Silver said the crash "produced a fairly significant fireball that shot out from under the pumps." A gas station attendant told NBC Connecticut the driver walked away with a pinkie injury from the SUV's airbag. Officials said everyone made it out of the gas station safely. "There was no significant injuries," said Silver. "There was one person transported to the hospital." Fire officials said the flames were under control within 10 minutes. DeCrescenzo said he's amazed the scene ended without any casualties. "I heard someone call it the 'Miracle on Main Street,' and that's really what it was. It was wild," he said. "That something could be so violent and aggressively on fire and no one was hurt, it was a miracle." The fire marshal and state Department of Energy and Environmental Protection are investigating.